The number of auctions scheduled to take place across the combined capital cities is expected to fall this week, with 2,357 currently being tracked by CoreLogic. In Melbourne and Sydney, auction activity is set to decrease across the two major markets, with 1,089 Melbourne homes scheduled to go to auction, down from last week’s final result of 1,366, and 940 auctions scheduled across Sydney, decreasing from the 1,101 auctions held last week. It is expected that volumes will see a decrease across the remaining capital cities this week. However, overall activity is higher than what was seen over the corresponding week last year (2,008). Paddington in NSW is the busiest individual suburb for auctions across the nation this week, with 21 residential homes set to go under the hammer, followed by Preston (20), Brighton (19), and Bentleigh East (18), all of which are in Victoria. 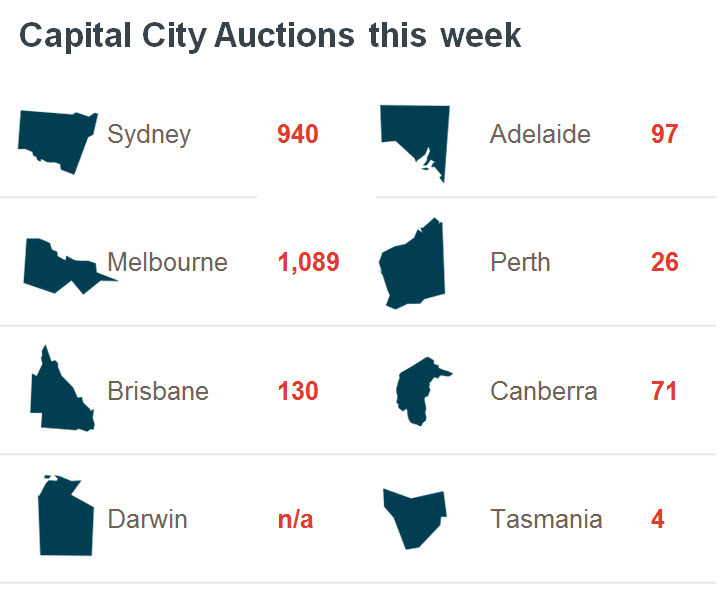 Last week, the final auction clearance rate fell across the combined capital cities, with 71.3 per cent of the 2,885 auctions successful, recording the third lowest clearance rate so far this year across the combined capitals. Over the week prior, a clearance rate of 73.1 per cent was recorded across 2,824 auctions. Both auction clearance rate and volumes were higher than what was seen one year ago, when a 67.7 per cent clearance was recorded across 2,480 auctions. Across Melbourne, the final auction clearance rate fell below 75.0 per cent for the first time this year, recording a 74.2 per cent rate of clearance across a higher volume of auctions week-on-week. There were 1,366 auctions held across the city last week, increasing slightly from 1,326 the week prior, when 77.9 per cent of auctions cleared. Last week saw Sydney’s final clearance rate fall to 72.7 per cent from 74.0 per cent the previous week, with the number of auctions held increasing over the week, with 1,100 held up from 1,075 the week prior. Across the smaller auction markets, clearance rates decreased over the week across the remaining capital cities, with the exception of Perth which saw an increase week-on-week. The Gold Coast was the busiest non-capital city region last week, with 96 auctions; however Geelong recorded the strongest clearance rate at 81.8 per cent. Downturn refresher: what happens when prices start falling?